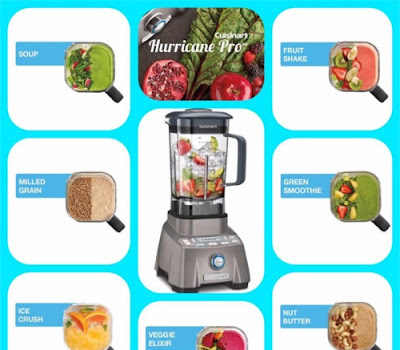 Cuisinart is giving away a Cuisinart Hurricane Pro Blender on their Facebook Page! This commercially-rated high performance blender features a 3.5 Peak Horsepower motor, variable speed control (1,500RPM to 24,000RPM), a 30,000RPM Turbo Boost feature and a 6-prong stainless steel blade to ensure everything that goes into the extra-large, 64-ounce, BPA-free Tritan jar is blended to perfection. You can make smoothies, soups, sauces, dressings, shakes, frozen cocktails, baby food, dough for baked goods and the list goes on and on. It truly goes #BeyondBlending and we want you to have one! Follow the steps at the link below to enter to win.